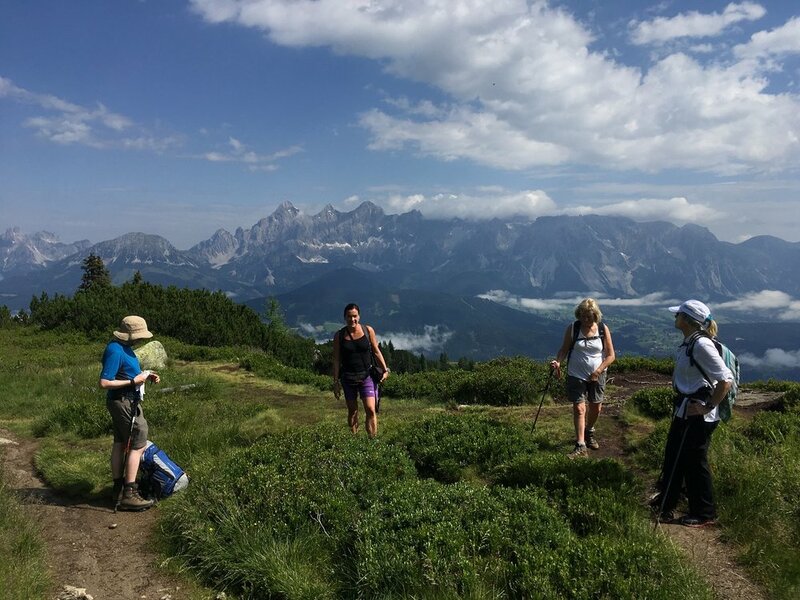 Walking the beauty along Austria's extensive network of walking trails through the alpine hills with stunning vistas of lakes, mountains and rivers; through lush valleys with wildflowers and wild horses, and climbing to the many summits that inspire the walker's soul. Walking has a long tradition in Austria and is the country’s unofficial national pastime in the summer months when the snows have melted. Austria’s walking culture and its natural beauty are a perfect match for walkers of all abilities. The landscape includes rugged mountain peaks, snow-capped mountains, glaciers, rolling hills, gentle pastures, waterfalls galore and many rivers and lakes, all complimented by picturesque villages. Some villages in the Austrian Alps dedicate themselves to walking or mountaineering and these villages are a perfect base for a walking holiday. The Austrian walking experience in the backdrop of the Alps is welcoming and spectacular! 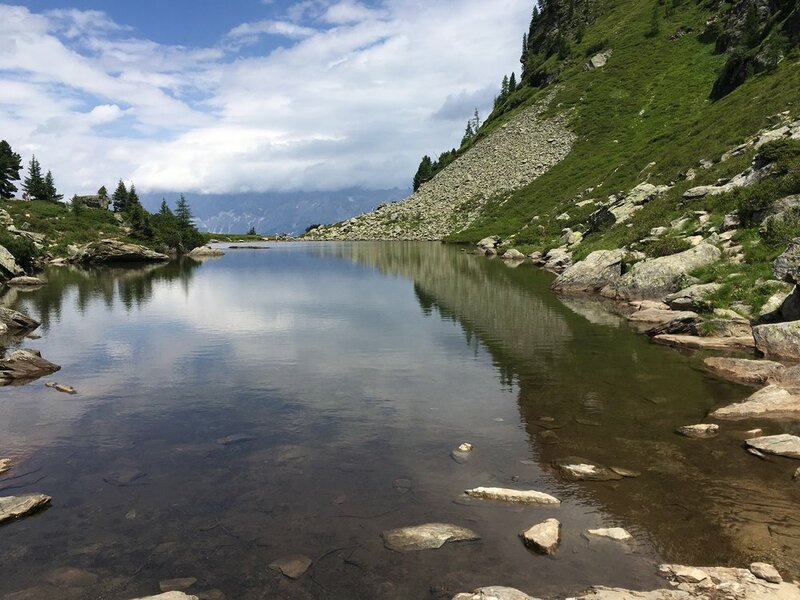 Discover the beauty along Austria’s extensive network of walking trails through marvelous alpine hills with stunning vistas of lakes, mountains and rivers; through lush valleys with wildflowers and wild horses, and climbing to the many summits that inspire the soul. Experience Austria’s alpine huttes nestled in the countryside, and the quaint villages which host customary festivals, markets and their regional cuisine. We walk five days and you have one free day to enjoy as you please – visiting nearby sights or villages, or just resting by the pool. We are based in Post Hotel located in Schladming for all seven (7) nights. This four star, family run hotel is situated in the heart of the village, close to cafes and shops. All rooms are en-suite and include a bathtub or shower, television, hairdryer, telephone, and mini-bar. Hotel facilities include a restaurant, lounges, Pavilion Bar Cabalou, modern spa facilities and fitness center. Wi-Fi is free of charge and is available throughout the hotel. Breakfast is self-service buffet and offers a wide range of breads, cheeses, hams, yogurt choices, seeds, nuts, cereals, fruit, jams, honey, tea, coffee, juices as well as a cooked option of eggs, ham and sausages. Lunches are at your expense. We usually stop at a Mountain Hutte along the trail or we may pack a lunch. The huttes serve traditional regional specialties and are home-made from locally produced ingredients. There are supermarkets nearby where you can purchase fruits, snacks and water if desired. Dinner is served to you in the hotel’s dining room and offers a choice of traditional Austrian starters, entrées and sweets. There are vegetarian options as well as a salad bar. There may be one evening where dinner is a hot buffet. Dinners for all seven (7) nights in the hotel’s dining room; the group generally eats together as a group. Transfers between the hotel and Salzburg Airport on arrival and return transfer upon departure. Transport to and from each day’s walk including ski and chair lift costs. Schladming-Dachstein Summer Card is free of charge for guests. The card entitles you to free transport on cable cars, ski lifts and the local bus transport withing the region. This is a land only holiday so your flight to and from Salzburg is not included. We are happy to assist you with providing flight information from your local airport. 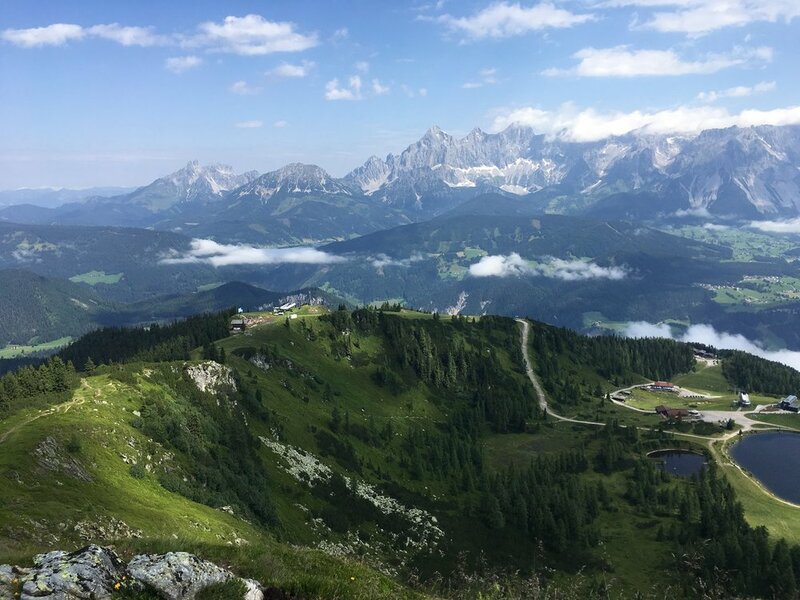 Whether you prefer gentler nature experiences or you are drawn by the high peaks, as you explore the paths of the Schladming-Dachstein region, you are certain to discover one destined to become your all-time personal favorite. Our walks take us over stunning ridges and down beautiful valleys. There are alpine meadows to amble through and fast flowing rivers with many waterfalls. 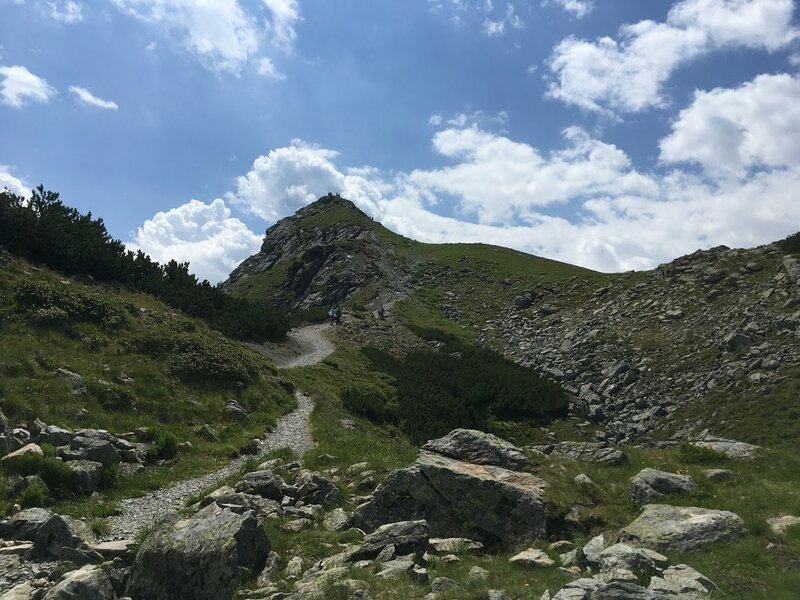 There are large peaks to conquer as well but we use ski and chair lifts to get us to within striking distance of bigger summits, the last few hundred meters can be steep but the views are worth the effort and there is a variety of scenery for the discerning walker. The terrain is good, with some loose stones and many tree roots on some paths. Green path walking is frequent. Climbing is steady with the occasional steep short stretch, not to be rushed and downhills are always a pull so you may want to bring a pole. We grade the walks as moderate with some short strenuous stretches. An easier shorter option is available on each day which means you will have a choice of either walk. Five days walking during the week’s break, with one day as a rest day. There are two grades of walking on our Austrian Holiday, moderate and easy and each is led by an experienced guide. All levels include some ascent and descent and miles covered will typically be lengthier for the moderate level, and all walking is done at an unhurried and manageable pace with stops to rest and take in the scenery. Our guide partner, well-versed in the area as well as in the terrain and weather conditions, will provide route details and path information for each day’s walking itinerary. Choose the option on the day of the walk which best suits your interests and fitness level. Whichever walking level you choose, you are guaranteed an invigorating experience amid stunning vistas. Moderate walking grade: We walk 7 to 9 miles daily and ascend and descend at least once per day up to 500 meters (1,650 feet) but generally over an hour and a half. We do not rush - there is too much to see, but we do stride out where it is possible. 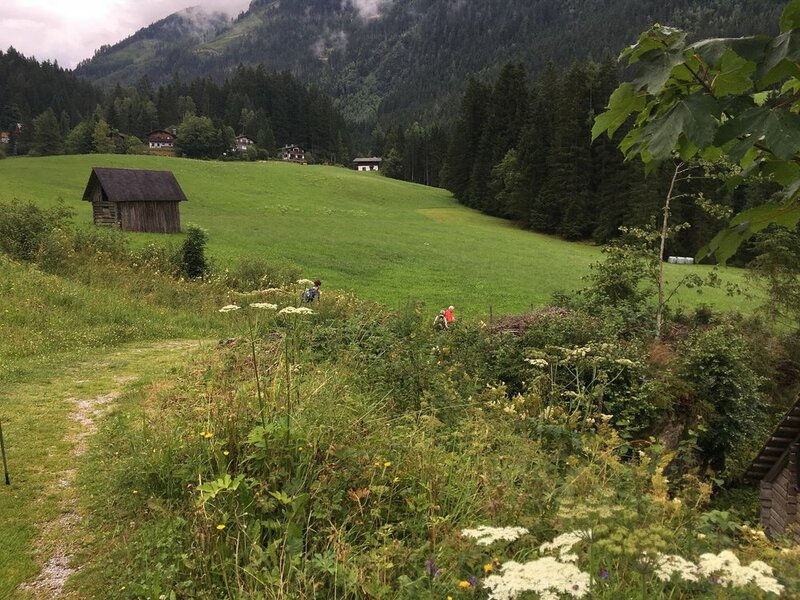 We do not rush the hills and ridges – talking, looking, learning about Austria is often the order of the day. Underfoot conditions in Austria are good. Easy walking grade: Shorter distances and walking may be at a slower pace. There will be hills to ascend and descend but we will take these very steadily and we do not rush. We often include sightseeing in the villages and other stops that are of interest. Schladming Area. Schladming originated as a small former mining town in the northwest of the Austrian state of Styria that is now a popular tourist destination. It has since become a large winter sports resort and has held various skiing competitions, including most notably the FIS Alpine World Ski Championships 2013. It is now designated as a city with the city center on the banks of The River Enns. The River Enns is joined by the River Untertal close to the city center and just before they join, there is a series of waterfalls. The city stands at 750 metres (2,450 feet) above sea level. The local population is 4.500 but it has trebled that number in the height of the tourism season in winter and late July and August. It is surrounded by super mountains with the Dachstien peak looming over the northern side of the city at 2900 metres (9,500 feet). The shopping area has many cafes, bars, restaurants and a variety of shops that cater to tourists along with a wide range of sports gear and ladies clothing shops. Monday is market daywith stalls mainly of crafts and local cheeses and hams. Many Austrians still wear local costume as part of their everyday life. Your Austrian base is Schladming in the Enns valley, the Enns is a lively river which flows east to join the Danube. The Enns valley is dominated to the north by the stark limestone mountains, of which Dachstein (the ‘Roof Stone’) is the largest. To the south are the peaks of the Schladminger Tauern. Salzburg. Visiting the magnificent UNESCO World Heritage City of Salzburg on your day off is an excellent option. It is about an hour away and easy to reach by bus and train. The old town of Salzburg is out of a storybook. It is guarded by the Hohensalzburg Castle and offers a nice strenuous walk on your day off (or there is the funicular). Salzburg is home to Mozart’s birthplace, there are domes and spires throughout the old town, it is home to the Sound of Music and visitors will see familiar locations used throughout the film, there is a growing artist community, manicured parks, quiet side streets, a setting along the river – all that makes it a fascinating city for the visitor. The historical district of Salzburg, in the backdrop of the Alps, has everything and whether you tour the sites or sit in a café in a charming square enjoying a sumptuous cake and people watch, you cannot go wrong. Getting to the Austria holiday. The price for this holiday is land only and does not include flights from the United States to Salzburg. The hotel transfers included in the price are from the Salzburg airport. It is ideal to arrive in Salzburg by mid-afternoon to allow yourself a bit of time to relax. We can help research your options for arranging travel to your holiday. Airfare will range between $600 and $1,500 round trip between the United States and Austria, depending on where your flight originates, the time of year and when you make your booking. Budget airlines from several European capitals may offer a better price if you are adding onto a trip to other European countries. Please note that the published holiday dates are the dates you arrive in your holiday area and not when you leave the United States. Passport and Visa Requirements for U.S. Citizens. Passports must be valid for at least three (3) months beyond the intended date of departure and issued within the past ten (10) years. It is further recommended that your passport have at least six (6) months validity remaining beyond the date of completion of the holiday and ensure there are four (4) blank pages in your passport. Consult the U.S. Department of State’s website for the most current country requirements. No Visa is required for stays up to 90 days. Weather. The average temperature in July is between 66 and 74 degrees Fahrenheit (18 -22 Celsius) but don’t forget we are in a mountainous area, so early mornings will be chilly. At night, expect the temperatures to go down to about 46 to 54 degrees Fahrenheit (8 – 12 Celsius). Some days may be warm as we are in high mountains at 2,000 metres high (6,560 feet), so you will need warm weather clothing early in the morning. It will almost certainly be very misty in the early mornings, but that is not an indication of what the day’s weather will be. The 64,000 dollar question is – Will it rain? Probably, and maybe around 4:00pm, it can have a good shower. Our guides carry umbrellas in their rucksacks – they say it takes 90% of the rain and protects their clothes – we cannot fault their logic and will be doing the same. One thing you will need is sunscreen – at 2,000 metres (6,560 feet) it may feel cool but the sun is very strong. Official language. German is the official language and English is widely spoken.